Pointwise was exhibiting at AIAA’s Propulsion & Energy conference this past summer in Salt Lake City, UT when one of our users visited our booth at the conference with a question about how they could split two intersecting connectors at their point of intersection. Astute readers will know that this capability isn’t readily available in Pointwise. 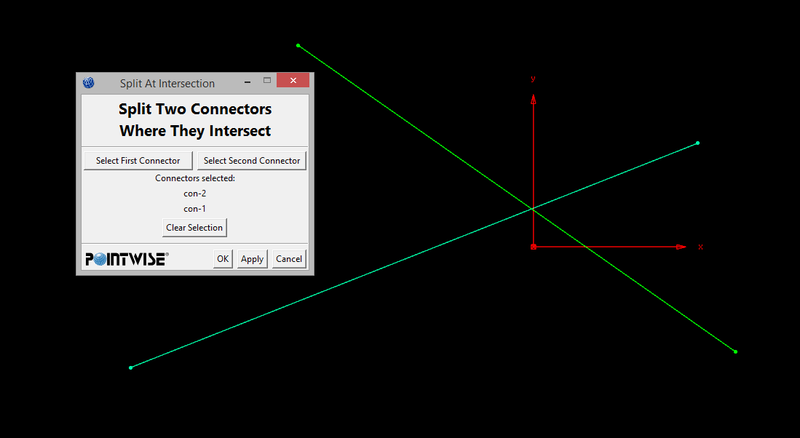 At most, one can select both connectors, and estimate the location where they are split using the cursor in Pointwise’s Split Panel. This got me thinking that perhaps a Glyph script could be written to accomplish this task. Pointwise can find the points of intersection of two sets of database curves via the Intersect… command found under the Create menu. These intersection points could then be used to split the original connectors. All that remained was creating the database curves from the original connectors. This is exactly what the script I ended up writing does. Of course, after I had written the script and forwarded a copy to the user originally requesting this capability, I noticed that we already had written a script that does exactly this and is hosted on our Glyph Script Exchange! Both scripts are now available at the project’s repository hosted on GitHub. You can use this link to download the GUI-driven version of the script. If you’re interested in the alternative script I wrote without the Tk graphical interactive elements, then you can download that version using this link instead. If you have an idea for a new Glyph script, and you would like to learn more about how to get started, then contact us via the comments section below or contact @Pointwise on Twitter. We’re also interested in learning more about the Glyph scripts our users have created. Get in touch with us if you would like to share and have your script highlighted here on Another Fine Mesh.